I need a ATv2 any decent price deal around now? What the different from the sellers other listing at 96 quid? Anyone know how jailbreak progress is goin on ATV3? just invest in a 3rd gen, it will get jailbroken in a month or 2 and … just invest in a 3rd gen, it will get jailbroken in a month or 2 and because it has a faster processor, it means no lag and better xbmc features for developers to create. i already have a atv2 connected to my living room tv. Wanted a second for the bed room. If apple ever make an actual tv what will they call it? Overpriced but very nicely designed Cinema Display? So no news/game shows/comedy series/documentaries? Besides which, cinema is not a word much used in the USA. Officially, just a streamer for iToys and, from Mountain Lion onwards OSX mirroring plus a few online services like Youtube, Netflix and iTunes. Once jailbroken, a low-power, silent XBMC unit. The only downside is no usb input, so all media has to be streamed either wirelessly or via network cable. Great just got mine. Heat added.Will go well with the Ipad I ordered off of here yesterday. Officially, just a streamer for iToys and, from Mountain Lion onwards OSX … Officially, just a streamer for iToys and, from Mountain Lion onwards OSX mirroring plus a few online services like Youtube, Netflix and iTunes. Once jailbroken, a low-power, silent XBMC unit. The only downside is no usb input, so all media has to be streamed either wirelessly or via network cable. does it originally come with safari? as a friend was tellin me you have to jailbreak it to get safari browser working ? What's the difference between the American Apple TVs and the UK ones? If the seller includes a UK power chord, are they effectively exactly the same? The atv3 isn't jail breakable at the moment. does it originally come with safari? as a friend was tellin me you have … does it originally come with safari? as a friend was tellin me you have to jailbreak it to get safari browser working ? No Safari - jailbroken or not. The best web browser available for the Jailbroken ATV is Couchsurfer. As above, there is no jailbreak for this yet - and likely will not be for the foreseeable future. Firstly because it is, for the first time, the only device with a single core A5 chip which means the jailbreak approach has to be started from scratch, more or less. Secondly, because this isn't as mainstream a device as the iPhone/iPad etc and therefore there are fewer groups/individuals working on it. However, it will come eventually. I'm personally very happy with ATV 2. I never watch 1080p. No lag. XBMC setup with plugins - can't beat it for the mere £80 I paid for it. sorry to be silly ? No you cannot. It is for streaming media. 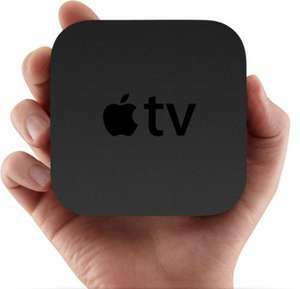 Out of the box it will give you iTunes streaming/rental. Netflix. Youtube etc. etc. The only way you can get terrestrial channels streaming is via a JB, which isn't out for this generation yet. What's the difference between the American Apple TVs and the UK ones?If … What's the difference between the American Apple TVs and the UK ones?If the seller includes a UK power chord, are they effectively exactly the same? Only Apple sheeple would need crappy 720p streamers. Get a playstation! But if you really want one, I'm sure it's a good deal! airplay to this with surround sound makes it fantastic. When I have parties round mine anyone who is on the wireless network can "DJ" and choose the song. I am a BIG fan of apple, but this has major problems with maintaining connection with iTunes, just the same as ATV2, which I have, but I wouldn't buy another until apple sorts out this very annoying issue. I am a BIG fan of apple, but this has major problems with maintaining … I am a BIG fan of apple, but this has major problems with maintaining connection with iTunes, just the same as ATV2, which I have, but I wouldn't buy another until apple sorts out this very annoying issue. My ATV2 has no problems maintaining such a connection. I'd put the problem down to your wireless router or computer. In an idealistic world, I would agree with you. But- most people would have no idea how to set up a raspberry pi, never mind the fact that it doesn't come in a case! Raspberry pi is not a consumer orientated product- not really. The thing about proprietary devices is they are simple to set up, simple to use, and work out of the box without any problems. For those who are not technologically capable/incompetent proprietary is the way forward! Hold on to your sandals! Hands up how many people have needed to contact Apple support? What percentge if the 100's of millions of customers have had problems? Slim. Very slim. It's a closed device for a reason - it's (almost) bulletproof because they set exactly what you can and can't do with it. Windows/Linux has to run on multiple hardware configurations which the developers have no idea or control of. The result? Unpredictability and unstableness. Closed platforms aren't for everyone, and in an ideal world I agree with the open source principal but the reality is the vast majority of users haven't a clue how technology works and something simple and trustworthy is right for them. Doesn't make them stupid (Brain Surgeons & Rocket Scientists buy iPhones). Thanks! That's what I'd hoped for. Stunning price for this magical and revolutionary internet television device. Its not just me LOTS and LOTS of people on apple forums with the same problems!!! Its not just me LOTS and LOTS of people on apple forums with the same … Its not just me LOTS and LOTS of people on apple forums with the same problems!!! Is XBMC even worthwhile now after MegaUpload etc. were closed down? Open Source exists as a business model because of chargeable support … Open Source exists as a business model because of chargeable support (which you need! )It's a closed device for a reason - it's (almost) bulletproof because they set exactly what you can and can't do with it.Windows/Linux has to run on multiple hardware configurations which the developers have no idea or control of. The result? Unpredictability and unstableness. Disagree with the 1st part (google is free as is the marginal cost of the internet since you already have it) but agree with the 2nd and 3rd part but I will take the variety and freedom that windows and linux provide me over Apple's OS however i understand that 1) i am interested in tech and 2) and competent tech wise. Dont think Apple products should be cold for the fact it is from Apple. Could I connect my macbook wirelessly onto my TV, if this is connected to my TV?